Piranesi as virtual architect and the Ichnographia Campus Martius as a virtual city. The Ichnographia Campus Martius as a vast (virtual museum) collection of architectural plans. A virtual museum of Roman architecture. A virtual museum of building types (esp., portici, horti, sepulchers). The Ichnographia Campus Martius is a foremost example of architectural virtuality, a virtual city, virtual archeology, a virtual museum of architecture. ...there came the realization that Le Antichità Romane begins with fragments of the Forma Urbis followed by displays of Rome’s city walls. This brings to mind the notion that Piranesi first presents the pieces of the puzzle followed by the edges of the puzzle. This is interesting in terms of the Il Campo Marzio then being the completion of the puzzle (and beyond), thus providing Hypersize SagaCity with its opening premise. Design an Ichnographia full of clues and inverted meanings. 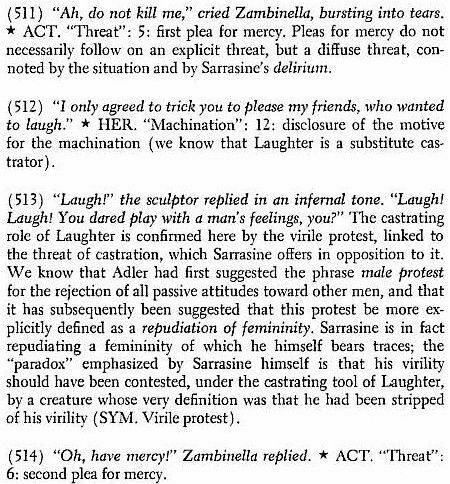 Somewhere in S/Z Barthes writes that laughter is an ersatz form of castration.